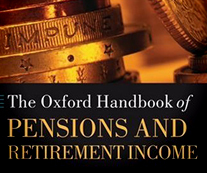 The Oxford Handbook of Pensions and Retirement Income is the only comprehensive review available of the latest research, policy-related tools, analytical methods and techniques, and major theoretical frameworks and principles of pension and retirement income. Featuring over 40 contributions from leading academic and professional experts, the handbook draws on research from a range of academic disciplines to reflect on the implications for current and future provision of pension and retirement income of demographic ageing, the changing financial circumstances of nation states, and globalization. An indispensable desk reference for researchers and practitioners in the area, it is also essential for policymakers and those with broad interests that include this very important area. To view a book summary and obtain ordering information, click here. The Oxford Handbook of Pensions and Retirement Income is sure to become an invaluable reference for researchers and students, actuaries and benefits counselors, corporate and labor-oriented analysis, and indeed all in the pension design and financial services business. Volume contributors are leading authorities who provide a systematic and thorough review of the diverse issues that arise in the structuring, management, regulation, and understanding of public and private pension systems. Chapters include a diverse set of financial, economic, historical and institutional perspectives shaping the key institutions on which so many millions rely for financial security around the globe. This book will be a welcome addition to my bookshelf. This is a fascinating and incredibly useful book for anyone interested in the problem of retirement income provision. Its 42 chapters by the leading thinkers and researchers in the subject cover almost every imaginable topic, from the history of retirement plans, through current structures and problems to the future. By producing this book Clark, Munnell, and Orszag have provided an invaluable resource. In terms of scale and scope, this is surely the most comprehensive handbook on pensions and retirement ever compiled. This makes it a ‘must-have’ for every serious student of this fascinating field. “Today, there are only few accurate overviews on the actual state of pension issues in an international comparative context. With respect to this fact, The Oxford Handbook of Pension and Retirement Income closes an obvious gap between theoretical concepts and practical experiences using a reader-friendly format. Combining leadership experience with practical background from comparative viewpoints, the authors provide useful insights into the different approaches and the common goal of pension systems worldwide. Many thanks to the publishers of this exciting oeuvre for an important contribution to modern socio-economic discussions on pension systems.